In drip irrigation (microirrigation), water is run through pipes (with holes in them) either buried or lying slightly above the ground next to the crops. Water slowly drips onto the crop roots and stems. Drip irrigation is a very efficient way to irrigation crops and has the advantage of lower evaporation than other irrigation methods, it is the most common type of "microirrigation." Drip irrigation is one of the more advanced techniques being used today because, for certain crops, it is much more efficient than traditional spray irrigation, where a larger portion of the water is lost to evaporation. In drip irrigation, water is run through pipes (with holes in them) either buried or lying slightly above the ground next to the crops. Water slowly drips onto the crop roots and stems. Unlike spray irrigation, very little is lost to evaporation and the water can be directed only to the plants that need it, cutting back on water waste. Microirrigation has gained attention during recent years because of its potential to increase yields and decrease water, fertilizer, and labor requirements if managed properly. Microirrigation systems can apply water and fertilizer directly to individual plants or trees, reducing the wetted area by wetting only a fraction of the soil surface; thus, water is applied directly to the root zone. Microirrigation is a low pressure, low volume irrigation system suitable for high-return value crops such as fruit and vegetable crops. If managed properly, microirrigation can increase yields and decrease water, fertilizer and labor requirements. Microirrigation applies the water only to the plant's root zone and saves water because of the high application efficiency and high water distribution uniformity. Microirrigation can irrigate sloping or irregularly-shaped land areas that cannot be flood irrigated. Any water-soluble fertilizer may be injected through a microirrigation system. Irrigation is one of the major uses of water throughout the world. In the United States in year 2015, irrigation withdrawals were an estimated 118,000 million gallons per day (Mgal/d), or 132,000 thousand acre-feet per year. About 63,500 thousand acres were irrigated in 2015. Of this total acreage, about 5,490 thousand acres with drip/microirrigation systems. Below are science topics related to drip or miccroirrigation water use. 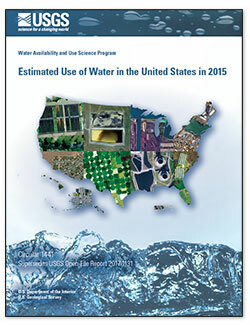 Below are publications related to drip or miccroirrigation water use. 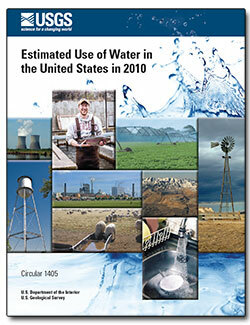 Below are multimedia resources related to drip or miccroirrigation water use. Flood irrigation of pecan orchards Rio Grande Project area, New Mex. Flood irrigation of pecan orchards in the Rio Grande Project area, New Mexico, June 2014.